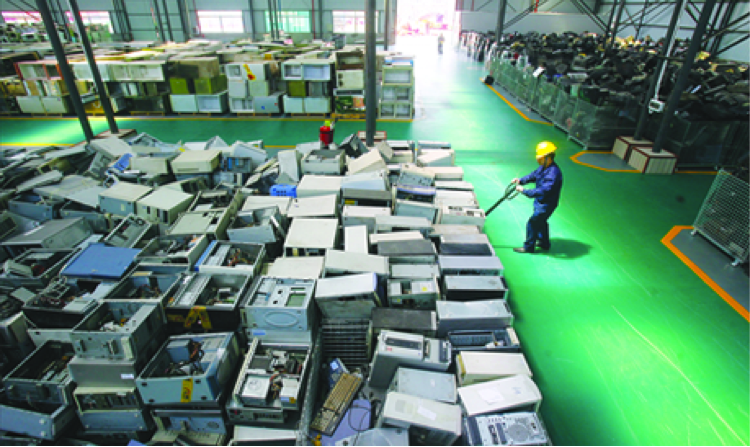 The electronic waste (e-waste) recycler E-Waste Systems, Inc. (EWSI) has abandoned its primary US-based recycling operations, leaving behind significant volumes of hazardous e-waste. The Geneva, New York facility is no longer accepting materials, and various e-waste collections events had been cancelled. Workers have not been paid since October 18 (1), despite never receiving pink slips of termination. Due to failure to pay the rent, the landlord locked the doors on January 28. EWSI similarly abandoned their Ohio facility near Cincinnati late last year. "We have yet another alarming case of e-waste mismanagement," said Basel Action Network Executive Director Jim Puckett. "Far too many irresponsible electronics recyclers hide behind the green word 'recycling' but operate like horse traders. This latest abandonment underscores the need for all consumers and business customers to do their due diligence. It also proves that governments' need to monitor and strictly enforce the applicable laws," said Puckett. "The public should beware." This latest story follows in the wake of companies in Arizona, Colorado, Maryland, Utah, Ohio, Georgia and other states that recently abandoned large piles of e-waste or sent it to irresponsible operations overseas or in the US. Sources have informed BAN that EWSI left behind a large quantity of material, in both its New York and Ohio locations. In Geneva, New York, an estimated eight truckloads of cathode ray tubes (CRT) and around a million pounds of intact televisions remain in the plant. Late last year, E-Scrap News reported that EWSI's main Springdale, Ohio location had closed under similar circumstances after they were asked to vacate the building on October 15 due to failure to pay rent. On October 17, EWSI stopped paying their Ohio workers. These workers are currently suing the company for back wages (2). The plant had only just had its grand opening on March 20, 2014, a short eight months earlier. They were evicted by a court order on December 9, but nevertheless left significant volumes of techno-trash behind. According to Ohio Environmental Protection Agency (EPA), the abandoned material is predominantly intact CRT televisions and monitors. The property owner has now taken responsibility for cleanup of the site, which is believed to be ongoing. Financial mismanagement and a lack of capital appear to be the cause for the EWSI closures, a concern regularly covered by E-Scrap News and other outlets in the last few years. EWSI became famous in the industry for its penny stock capitalization, then later its reverse stock split, and for overstating its revenue in an annual government financial filing. EWSI was also well known for its constant press releases claiming new global expansion activities, new strategic partnerships, and new acquisitions, despite little evidence of actual financial investment or growth. While chief executive officer and founder Martin Nielson made many promises and spoke the language of responsible recycling, EWSI's penny stock kept plummeting. It is currently listed at $0.0004/share. In July 2013, EWSI acquired 2TRG, then an R2 and e-Stewards certified recycling company, believing it could buy the certificates as well. However, EWSI voluntarily withdrew their e-Stewards certification on June 14, 2014 after discussions with BAN regarding the challenges present in EWSI's operations. Based on a review of past website listings, it appears that EWSI retained the R2 certification for the Ohio plant in July of 2014 and then solely at their Geneva plant from at least mid-January 2015 until last month. Reportedly, some EWSI managers and employees are still holding out hope that financial problems can be remedied and the facility can re-open in the future. At this point, though while the abandoned material still technically belongs to EWSI, there seems little likelihood that the steadily declining venture will rebound, back wages will be paid, and leases and permits renewed. Reporters can't reach Nielson for comment on any of the outstanding questions regarding his company. He is presumed to be in London. Meanwhile, the property managers and state governments will be forced to make decisions regarding the toxic, abandoned e-waste in the coming weeks.